The Utica OD reported that Anthony Spiridigloizzi is the newly appointed president of Munson-Williams-Proctor Arts Institute. With that in mind, he said, his main goals for MWPAI include improving the visitor experience at the institute’s Museum of Art and strengthening the bonds between the community and the institute as a whole, including its school of art and performing arts program. Projects under consideration for the future include creating a more welcoming rear entrance for the museum – since 95 percent of visitors come in through the parking lot doors instead of the main entrance on Genesee Street – adding a café, and expanding social events such as docent-led tours and art receptions. “We want to really create a welcoming environment … to focus on the visitor, provide some better visitor services and additional visitor services” Spiridigloizzi said. The institute also will continue cultivating its PrattMWP college program, which currently enrolls 100 new students each year, he said. Moving forward will require an increased focus on fundraising. Spiridigloizzi started at MWPAI as treasurer in 1982, having previously served as comptroller for the local United Way. After adding vice president of operations to his title in the 1990s, he served as “second in command” under former institute presidents Milton Bloch and Daniel O’Leary, and as acting president after each man’s departure. He was appointed president by the institute’s board of trustees on Dec. 20, although the decision wasn’t made public until Tuesday. In a release, MWPAI board Chairman William Locke said Spiridigloizzi’s 29 years of service and dedication were one of the assets that led to his appointment. Spiridigloizzi, for his part, said he was “very honored and very excited” to be appointed on a permanent basis. It has not yet been decided how his previous position will be filled. Unlike O’Leary, who resigned in January 2010 after less than two years as head of the institute, Spiridgloizzi is a native of Oneida County with strong ties to the community. He graduated from Thomas R. Proctor High School in 1969 and Utica College in 1973. The New Hartford resident said he recognizes that MWPAI has a role to play both here at home and in the national arts scene. Recent exhibits have been successful at spurring attendance, with more than 14,000 people viewing the “Wedded Perfection” dress exhibit this summer, and more than 7,000 visiting the “Ansel Adams: Masterworks” collection. Spiridigloizzi said he hopes to “continue the progress we’ve made over the past year” with a diverse array of exhibits in 2012 and beyond. “LitGraphic,” an exhibition of art from graphic novels opening in March, is just one example of what’s to come. “I think there’ll be a blend, a mix of exhibitions – some that are broad and popular in appeal, but always, always maintaining the quality we’ve been known for,” he said. We encourage your attendance and participation to our Latino Celebration. Please feel free to bring a friend or family member along. Also, would like to invite the community to join this association, as it is our annual membership drive. There will be Latino cuisine served along with refreshments, and music. We are asking for people to bring a child’s toy to be donated. Tickets: $15, adult; $10 Senior Citizens, $5 children (6-18 years old, Free children age 5 and under. To improve the standard of living for all residents of the Mohawk Valley through various services that will educate, empower, achieve awareness among different cultures, help shape young minds, and demonstrate the great opportunities available within the Mohawk Valley. Please forward to anyone, in your eamil list serve. New York Council of Nonprofits, Inc. and United Way of the Valley and Greater Utica Area announce 2012 Assessment Program for the Valley and Greater Utica Area Nonprofits. The 2012 Assessment Program is intended to provide direct assistance to nonprofits in specific operations areas such as board governance, program, financial, planning, among others. This assessment will help improve the organizational performance and well being of local nonprofits. In order to apply, please access the online application HERE. Applications will be accepted starting December 1, until the end of the month. New York Council of Nonprofits is the premier governance, management, and support services organization serving charities in the state. NYCON has a membership of 3,000 charities of all types and has offices in Albany, New York City, Buffalo, Poughkeepsie, and Oneonta. For more Information visit www.nycon.org or contact Andrew Marietta at 800-515-5012 ext 141, or at amarietta@nycon.org. United Way of the Valley & the Greater Utica Area is a local, independent non-profit organization funding area programs and services, providing a safety net for our community and addressing crucial community issues in the impact areas of health, education, and income. For more information about United Way, or to donate to the annual campaign, visit www.unitedwaygu.org or call (315) 733-4691. What are the mission-critical conversations that nonprofit board and leadership teams should have during the nation's growing financial crisis? Join philanthropist Mario Morino, chairman of Venture Philanthropy Partners, and Bob Ottenhoff, GuideStar's president and CEO, as they engage in a Q&A-style dialogue about Mario's new book, Leap of Reason: Managing to Outcomes in an Era of Scarcity, which is now in its third printing and has generated vigorous discussion throughout the sector. They'll discuss the converging economic and social trends that will drive nonprofits to be more intentional in defining their approaches, more rigorous in gauging their progress, more willing to admit mistakes, more capable of quickly adapting and improving—all with an unrelenting focus and passion for improving lives. Click Here to Register for the free webinar today. President and CEO, GuideStar USA, Inc. Being likened to the superhero Batman on Twitter recently, Cory Booker responded to a supporter of his by responding, “I look horrible in tights.” Although the Mayor of Newark, N.J., isn’t denying the claims, he has an alibi: inspiring hundreds of Uticans at the Stanley Theatre. After the Oct. 19tevent, many of us in the audience gathered in the lobby of the majestic stage wondering what would come next. Mayor Booker’s speech inspired those of us who were sitting on seats’ edge, and we want to share his message. He was speaking about “How to Change The World with Your Bare Hands.” He has led by example, showing us what can be done. Applying this advice, while leaving the Stanley, organizers of the event, The Community Foundation, partnered with Mohawk Valley Community College to facilitate a discussion around what our next step should be. -- Promote Utica and love the area. -- Increase local businesses with focus on eateries and farming: Encourage the market for ethnic food by promoting local farming and restaurants. -- Unite the diverse population: Mayor Booker said, “Here is the lesson of snowflakes: Individually beautiful yet fragile, but look how strong they are when they all stick together.” The acceptance and welcoming nature we show to newcomers of this area must continue to spread. -- Examples of educational success in our community must be shown. We must inspire educational partnerships and parent involvement in order to improve youths’ path to post-secondary educational opportunities. -- New leaders in the community must come forward. -- Lastly, and most importantly, Utica needs to hear from you. We must hear ideas from new, energetic, excited citizens. Please find a way to make your voice heard. Take an hour out of your week to go to a meeting, or event and share your knowledge and passion to make a change! It is truly astounding what Booker has done for Newark. He is one man, and he has transformed a city. We are more than 60,000 and growing; we must create the change we envision our home to undergo. We must act as a community to grow together and transform our community. The points outlined above serve simply as ideas a small number of us have discussed. There are numerous opportunities for change. Think of what you love most about living in the Mohawk Valley and make it better, think about an area of need and improve Upstate New York. Discuss these issues with friends, coworkers, family, and neighbors. Volunteer, tweet, donate, discuss, post on someone’s wall, create a group, change our area for the better in anyway you can! André Short was born and raised in the Utica area and attended MVCC and SUNY-Cortland pursuing a degree in adolescent education in English. He teaches at Whitesboro High School and has become active in community involvement and internet blogging. Bloomberg News Governor Cuomo has ordered 11 health insurers, including those that are “nonprofit,” to pay back millions in customer overcharges. Specifically, Cuomo is ordering the insurers to pay back $114.5 million, because the companies in question spent less than 82 cents of each dollar on health care. The organization with the second highest payback to be made is Excellus Health Plan, a nonprofit Blue Cross organization based in Albany. Excellus will be required to repay $21.4 million. “In this economic climate, every penny counts and in this case, insurance companies were overcharging New Yorkers to the tune of millions of dollars," Governor Cuomo said. "This should serve as a message to companies that we are watching, and we will not tolerate any action that wrongly hurts the finances of the people of New York." Partnering for Financial Success Panelist Questions Now Available! Questions about partnership and mergers in the area of Budget/Finance. 1) During a partnership or merger does the more profitable entity become the dominate player making all the decisions? 2) Procurement from each other in the area of products and services is a way to generate savings and revenue for each other. How is that being operationalized by each entity? 3) What impact on each of the partner's budget would a merger have and what are the steps you follow to get the finances of two organizations merged? 4) Was there anything required of you by your funders and or contracts/grants in order to merge? 5) Are funders more supportive of an application from a strong partnership pairing or a merged entity? Questions about partnership and mergers in the area of Staffing. 1) How do you determine who stays, goes and what role each person plays? When are these decisions made and how do you handle the potential fallout or impact? Questions about partnership and mergers in the area of the Board. 1) Do both Boards automatically merge into the surviving organization, or how do you handle board consolidation? Question(s) about partnership and mergers in the area of Facilities. 1) Who is responsible for any post merger facility costs? Question(s) about partnership and mergers in the area of Fund Development (fundraising). 1) If a donor believes in an organization and that organization merges or forms a partnership with another organization, what are the chances of losing that donor? How do you keep them? Question(s) about partnership and mergers in the area of Identity. 1) During a merger or partnership, do you create a new identity? 2) What are strategies for conveying merger as a healthy step forward (as opposed to big fish consuming little fish)? 3) Can one organization really be everything for everyone, or is there evidence to support the benefits of remaining unique organizations to continue to provide service to the field? Question(s) about partnership and mergers in regards to the Big Picture. 1) How do you discuss merger with your competitors? 2) During a merger or partnership, can two nonprofits have different visions? Can you blend organizations with different missions? What evaluation tools do you have that measure the community impact of your partnership, collaboration, or merger? New Steering Committee Member Announced! The Mohawk Valley Nonprofit Leaders Group Steering Committee would like to welcome Lucia Bliss, Executive Director of the Herkimer County Community College Foundation, to the Group! The Committee is happy to have Lucia on board. Interested in joining the Steering Committee, or doing more with the Group? Contact us and let us know. Fund Development Program Videos Now Available! The panel featured: Judith Reilly, Executive Director, Compeer of the Mohawk Valley; Frank B. DuRoss, Executive Director of Institutional Advancement, Mohawk Valley Community College MVCC; Steve Robinson, Director of Programs and Training, The Peacemaker Program, Inc; and Nancy M. Benz, Vice President for Fund Development, Planned Parenthood Mohawk Hudson, Inc. Things are really rockin' here at KEYS, and our workshop series programs at KEYS are just exploding! We are hiring presenters to help us with our Music Make Cents workshops that we provide for our day care providers, staff and our KEYS families. We are spreading the word through people we know, because referrals are the best way to get the best people! I am sure you are all set, but if there is someone you know who may be a good fit, please send me their contact info, or have them contact us. If you know someone who would be interested, please have them contact Colleen Bennett at 315-363-6446 or by email at colleen@keysprogram.org. By Andrea Berry and Chris Bernard, August, 2011 This article was originally published in the August 2011 issue of The NonProfit Times. •Personalized Emails. Most organizations are already sending automatic emails to people who have donated online. A little creativity can increase the impact of those emails. Nonprofits with a small staff can pass around a list of donors and their email addresses and have a couple of different people send personal emails thanking them. Better yet, organizations that serve a certain populace, such as schoolchildren or artists, can line up a few of them to write personalized thank-yous that show people the power their gifts have to change lives. There’s no cost other than staff time. •eNewsletters. Many nonprofits have newsletters. It’s easy to turn them into enewsletters to email to donors, or to create a periodic enewsletter exclusively for donors offering short articles about special projects they’ve funded. Asking celebrities or experts to write a guest article or answer questions can give a newsletter a bit of appeal, and compelling stories and interviews can be of real interest to donors. •Online Profiles. Organizations can use their newsletters, blogs or websites to profile donors on an ongoing basis. To appeal to the widest possible audience, they can profile “typical” donors -- not necessarily the most generous or the ones who have been giving the most years running -- as a powerful thank-you. A profile of someone who gives a small amount despite their limited income because a nonprofit’s mission is near and dear to them, or who has a great personal story as to why they support an organization, can inspire other donors to give more. •Online Gifts. Many nonprofits offer incentives such as T-shirts or coffee mugs to those who make a certain level of donation. 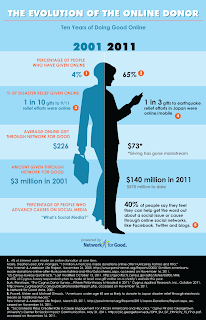 What about online gifts of appreciation instead of, or in addition to, these real-world gifts? Offering donors access to a mission-related webinar provided by experts, or to an online Q&A with a “celebrity,” can be a rewarding thank you. Organizations can mine their networks for potential candidates -- people are often grateful for the opportunity to contribute if given the chance. Other ideas include a mobile app related to the organization or mission, or an online game. As opposed to physical gifts, many online gifts cost nearly the same whether they’re given to one person or to hundreds of thousands. •Social Media Shout-Outs. It’s a good idea to thank people publicly, say in a list-wide email, because there’s a certain momentum to donations -- they can gather speed along with mass -- and because some people like the credit. But there’s a lot to be said for the perception of intimacy a personal contact can create, which is why the best campaigns incorporate both. Using multiple channels to give donors rolling shout-outs during an ongoing campaign can include Facebook, Twitter, email and a blog. For example, a “Donors of the Week” post on Facebook, or a thank-you can be tweeted every time someone gives more than a certain dollar amount, like bartenders ringing the bell for a big tip. Linking to donors’ own sites or blogs, if they have them, is another subtle means of thanking them. •Highlight Early Donors. Approaching a set of major donors early in the campaign to seed a matching fund that would then be promoted to other prospects through emails and the website can work particularly well for corporate donors. It allows them to essentially “sponsor” the email and online fundraising campaign, and gives them publicity for their gifts. •Website Leader Board. For friend-to-friend fundraising campaigns, in which supporters raise money from their own networks on behalf of an organization, it’s possible to create an online leader board where fundraisers “compete” good-naturedly against each other’s campaigns. These public rankings can be a powerful way to thank high performing teams and to incent others to do even more. •Real Time Giving Updates. For live events where people are encouraged to give, with a little technical know-how, it’s easy to project the gifts onto a screen as they’re received. This can be as simple as typing the gifts into a document that’s projected from a laptop, to posting them in real time on Twitter and projecting the organization’s Twitter stream. Twitter also allows community members who aren’t there in person to vicariously experience the excitement -- and be inspired to give online. •Videos and Photos. More and more organizations are harnessing the power of video to capture and convey emotion often lost in email, and with video capabilities now included in nearly every camera and phone, it’s never been easier. From a staff sing-along to a classroom full of children thanking donors for their gifts, the ideas are seemingly limitless. Videos can be fun, or they can be serious. It’s up to the nonprofit to set the tone. Photos can be used in a similar way, for example, as a slide-show set to music that shows constituents or events or the beneficiaries of funding. These can be posted on the website and sent to donors as links in their thank you emails. •Interactive Thank You Pages. 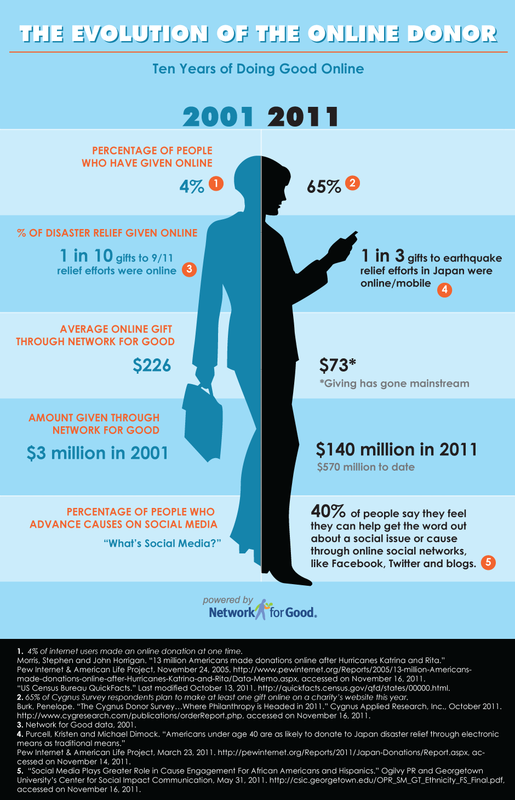 When donors click a button to donate online, they typically see a thank-you web page. Enhancing this page with something more compelling, like a Flash fireworks display or a thank-you video or slideshow, can provide a more exciting option. Since the donor’s name and information is already in the system, it’s possible to personalize the video, for example, by superimposing the donor’s name onto a “Thank You” sign held by a child served by the organization. •QR Codes. Growing in popularity, QR codes are the black-and-white graphics that look like bar codes that link people to a website when they scan them with their smartphone cameras. Including a QR code in a thank-you mailing or email is an innovative way to send donors to one of the web pages or videos discussed earlier. It also provides tech savvy donors an easy way to follow a link, and doesn’t require anything but the space in the letter. Most of these ideas can be executed for free by someone with a firm grasp of computers. Some might require an investment, some specialized knowledge, or the help of a programmer, writer or consultant. But donors are the lifeblood of your organization, making them feel appreciated is a good way to show gratitude and keep them donating. As nonprofit organizations and professional fundraisers court today’s savvier donors, it’s not always about who can throw a bigger, splashier fundraiser or a swankier black-tie event. “If you’re looking at events and things that are going to pull people out, the level of competition is the same (as before the recession began),” said Katherine Lowe, membership chair and member of the board of directors for the Central New York Chapter of the Association of Fundraising Professionals. Lowe also is community relations director of Meals on Wheels of Syracuse. The real competition is in reaching donors with your mission, because that’s how they decide where to place their hard-earned dollars, Lowe said. Nonprofit organizations and fundraising professionals are focused on building long-lasting, solid bonds with individuals in their communities. Lowe emphasized that matching an event to an organization is a unique fit — what works for one organization may not work for another. A volunteer-based organization may enjoy awards dinners that single out and honor a volunteer each year, but that wouldn’t work for everybody, she said. Instead, the trend is toward events that are tailored to the community, its desires and what it can support. “I think it’s something you really look to your donors (for),” Lowe said. Maria Alberico, regional director of Special Olympics New York, Central Region, agreed. But when the Special Olympics of New York asked their fundraisers what they wanted, the answer was clear — something totally different. Special Olympics responded by organizing events such as The Polar Plunge, where sponsored fundraisers take a winter’s dip into icy waters to raise money. The event has become one of their most popular fundraisers. The Central Region had 400 participants last year. “It’s that kind of wacky, thrilling, daredevil kind of event that doesn’t get lost in the walkathons,” she said. The organization’s most recent event, Over the Edge, was held Thursday. It’s a fundraiser in which donors rappel over the side of a building to raise money. It had been successful in other areas of the state, Alberico said, with more than 150 participants in 2010. In the event’s first year, 40 participants rappelled down the side of the Adirondack Bank Building on Genesee Street in Utica. While events like Over the Edge or The Polar Plunge present unique opportunities for their participants, it’s important to make sure the connection is made between the event and the mission of the Special Olympics, Alberico said. “We serve 51,809 athletes in the State of New York,” Alberico said. Nearly 7,000 of those athletes are in the Central New York region. One of those athletes, basketball player Art Lindsey, went “Over the Edge” at a media day prior to the fundraiser, bringing attention back to the organization’s mission. “In the end, this is why we do this. We have a great group of folks,” she said. While Special Olympics of New York found in this case that donors were looking to walk on the wild side and raise money, Lowe said that’s not always the norm. She said fundraising professionals are becoming cautious about planning “huge, splashy events.” They often are more expensive to put on and can cut into the net proceeds. Stevens-Swan Humane Society has been able to effectively use its fundraisers to build upon the strong connection the community already feels to animals and the organization’s mission. In fact, they identify with the organization’s mission to such a degree that community members frequently organize events and donate the proceeds to the humane society. Last weekend, for example, the annual Animal for Animals benefit concert event took place. It was organized in memory of Ric “Animal” Morehouse by his stepson. As a professional fundraiser, Lowe said, that is the ideal scenario: to have people who are willing to put together an event and donate the proceeds to your organization. Whether they’re at an event organized by the humane society or helping out one of their many supporters, Kraus said the special events raise money but also highlight the work that the shelter is doing. They bring shelter dogs the Wiggle Waggle Walkathon each September – even finding some of them homes at the event. And when it comes down to it, that’s what fundraising is all about, Lowe said. “Fundraising, at its core, is really about relationship building,” Lowe said. In Central New York, our local not-for-profit organizations tend to feel the pinch of challenging economic times more acutely than their for-profit counterparts. Often, a simple increase in organizational capacity can help not-for-profits withstand the turbulence of the market and continue to achieve the goals of their missions. To facilitate this, The Community Foundation of Herkimer & Oneida Counties, Inc. is introducing a simplified mini-grant program. This program is designed to help not-for-profits apply for funding of $20,000 or less that will be used for capacity-building purposes. For this process, capacity building is defined as something that “improves organizational capacity and competence;” this can include strengthening areas such as administrative systems, management, financial resources and governance. Historically, capacity-building grants have been invested in creating strategic or resource development plans, training and education for board and staff and purchasing new technology, to name but a few examples of activities that strengthens an organization’s foundation upon which its mission and programs rest. The application for mini-grants is significantly shorter than the standard grant application. This mini-grant program is a featured component of The Community Foundation’s competitive grantmaking. Capacity building grant requests for amounts over $20,000 may still be submitted, but are subject to the standard submission and review. Jan Squadrito is the Foundation staff contact for this program and all competitive grants. Interested parties should contact her at (315) 735-8212 or jsquadrito@foundationhoc.org for more information or to begin the application process. The Community Foundation has been a force for improving lives and promoting philanthropy throughout Herkimer and Oneida counties since 1952. The Foundation has made more than 4,700 grants totaling over $37.2 million in support of causes ranging from education to health care, the arts to the environment. Grants are generated by the more than 285 funds that comprise The Foundation’s endowment, established and advanced by area individuals and families. For more information about The Community Foundation’s work in Herkimer and Oneida counties, visit www.foundationhoc.org or call (315) 735-8212. WKTV reported that effective July 28, 2011, the American Red Cross of the Mohawk Valley and Rome Area Chapters are consolidating into a single new chapter, which will retain the Mohawk Valley Chapter name. The consolidated Chapter, which is part of the American Red Cross-Central New York Region, will continue to serve the communities of Oneida and Herkimer counties. Rome Area Chapter Executive Victor Fariello will lead the new chapter. Fariello, who has been chapter executive in Rome for the past 3 years, has a long career in the nonprofit sector across the entire Mohawk Valley region. The new chapter will be headquartered at the current Mohawk Valley Chapter office at 1415 Genesee Street, Utica and will continue to maintain its presence and services in Rome, Utica and Herkimer. The boards of the Rome and Mohawk Valley Chapters met recently and agreed upon the name of the Chapter. They continue to work on the process of consolidating into one chapter. Programs and services will be unaffected by this change. The Red Cross will continue to respond to disasters, provide health and safety training, collect blood and provide services to military members and their families. According to Fariello the consolidation is part of a nationwide effort by the Red Cross to reduce costs while maintaining vital services. Fariello adds that the organizational advances implemented so far have increased financial stability, created a stronger brand, invigorated fundraising systems and enhanced services and training programs for the public. Co-chairs — Bjong Wolf Yeigh, president of SUNYIT, and Lawrence T. Gilroy III, president of Gilroy, Kernan & Gilroy, Inc.
General members — Charles Green, president & CEO, Assured Information Security, Inc.; Marianne W. Gaige, president & CEO, Cathedral Corporation; Nicholas O. Matt, president, Matt Brewing Company; V. Daniel Robinson II, president & CEO, New York Central Mutual Insurance Company; Richard C. Smith, president and CEO of Robison & Smith; William L. Keller III, president & CEO, Keymark Corp.; Nancy Pattarini, president & CEO, The Paige Group; Juanita Bass, owner, Juanita’s Soul Classics Inc.; Sheila Murphy, owner, Nunn’s Home Medical Equipment. Frank DeRiso, president, United Food & Commercial Workers International Union; Randall VanWagoner, president, Mohawk Valley Community College; Margaret O’Shea, president & CEO, The Community Foundation of Herkimer & Oneida Counties; Mary Morse, owner, Kwik-Kut Mfg. ; Richard Ball, owner, Schoharie Valley Farms/Carrot Barn; Steven DiMeo, president, Mohawk Valley EDGE (Economic Development Growth Enterprises Corporation); Michael J. Reese, president & CEO, Fulton County Economic Development Corporation; Deborah Auspelmyer, president, Montgomery Area Chamber of Commerce; Carolyn A. Lewis, economic developer, Otsego County Economic Development; Scott White, president, Bank of Cooperstown.